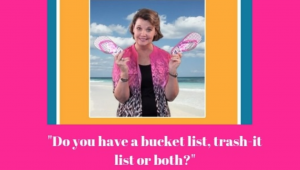 I have heard the term “bucket list” but the other day I decided a “trash-it list” is more important. Is that weird or what? Here is my theory: If you want an awesome “bucket-list” then first you must know what to trash. Suppose you decide to go on a dream trip but are super-stressed. That wonderful experience may be ruined if unhealthy emotions consume your mind. I know this for a fact! So, here is your assignment- set up two buckets but make sure one of your buckets is used as a trashcan. Write down all the great goals or experiences you may want to have during your life. Now on other piece of paper, write all of the stuff that may hold your back from having an amazing experience. Now THROW! I mean wad up the paper and give that harmful stuff a hard throw into the trashcan bucket. To complete the task, read your awesome goals and respectfully place the paper into the good bucket. THERE! All done except for REALLY acting upon it. Now, you know what can hold you back so start being trashy!